When The LEGO Group set out to create its new hub in Shanghai (ShangHub), which is one of five major hubs for The LEGO Group worldwide, people were, as always, placed at the center. “ShangHub endeavors to embody the LEGO® values of Imagination, Joy, Fun, Creativity, Learning, Caring and Quality to the core. By raising the value of user experience through human centric design, the ambition was to create a world class workplace where only the best is good enough,” says Sudhir Saseedharan, Design Manager, Global Design and Engagement, Corporate Facilities. The Global Design and Engagement team at The LEGO Group collaborated with Robarts Spaces, an interior design and architecture firm headquartered in China, to create the new workspace. The highly integrative design process reflected the LEGO team’s objective to create and nurture “engagement through design”, fostering collaboration, innovation, fun, respect with global & local connectedness to each other, to customers and to the LEGO brand and history. 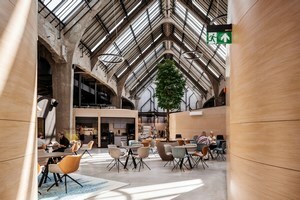 The ShangHub is the latest LEGO office designed with the “New Ways Of Working” strategy with employees empowered to choose their work setting, from a variety of workspace options, removing physical and organizational barriers to creativity. 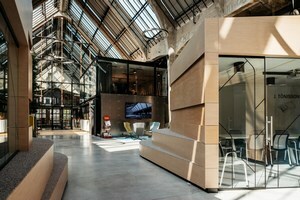 Multiple design workshops were conducted, each themed with a different objective, such as overall design principles, functional layouts, and wayfinding providing fun and fostering creativity, but also resulting in thoughtful, inventive consultations on interpreting the LEGO brand into the space. This collaboration was also highly productive, with the design team moving from blocking layout to approved design layout in just four days. 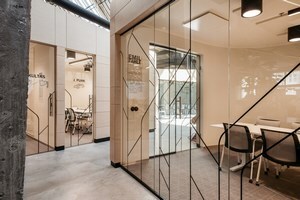 With a range of workspace formats, such as an energizing work café, a Zen Zone, Play Zone, along with team huddle and silent spaces, the team designed a zoning strategy for the three levelled, 7,000sqm space, from Active at the highest floor to Quiet at the lowest floor, with workspaces shifting from highly collaborative to silent. 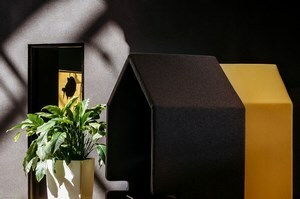 Transitional areas were designed to provide opportunities for spontaneous conversation and creativity, with kiosks located nearby, providing facility services such as printers, stationery, wayfinding, and coffee-tea points. At its most active, the ShangHub features an expansive Café, itself with numerous typologies of seating, postures and settings for casual recreation and refreshment, a pantry stocked with healthy snacks, a coffee bar complete with professional barista, as well as typologies for individual working, group meetings and ideation sessions. The Café’s bleacher podium, punctuated by numerous round soft pads, evocative of the dots on LEGO bricks, regularly hosts Town Hall meetings and other knowledge sharing events. Nature is present in real form through large planters which function as spatial dividers and provide bio-phylic benefits to the environment, and is graphically represented on glass installations. The LEGO Mini-figures as macro-graphics create a bold presence throughout the space. LEGO brick spheres and cuboids hang, in cloud-like clusters, emphasizing the products’ materiality and design, while appearing as contemporary reinterpretations of Chinese lanterns. A white Chinese pavilion, flanked by a bamboo canopied path leading to a hidden corner for playing Chinese chess, enjoying the Shanghaiskyline or cultivating inspiration for a new project to inspire the next generation of builders, is located near the entrance to the LEGO ShangHub Board Room, all subtly referencing traditional Chinese design, inspiring creativity and engagement and reinforcing the LEGO visual identity. Around the office are design walls featuring LEGO creations created specifically for the space by staff and by local children who are invited to create LEGO murals, fostering local community engagement. Engagement through design and design through engagement remain the principles animating of the new LEGO ShangHub.